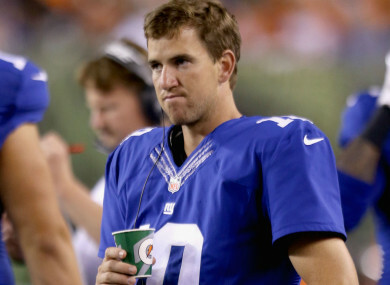 The New York Giants slumped to a 19-3 loss to the Dallas Cowboys in their NFL opener. THE NFL SEASON is underway but no-one told Eli Manning and the Giants offense as New York suffered a 19-3 loss to the Dallas Cowboys. Manning was fooled by the Cowboys’ defensive strategy and pressure at AT&T Stadium on Sunday as an Odell Beckham-less offense failed to score a touchdown. The first two quarters were ones the Giants wanted to forget, as the offensive line could not get a push for their running backs or give Manning enough protection to throw the ball downfield. New York, playing without Beckham (ankle), managed just two first downs and 50 yards from scrimmage going into half-time. With Beckham out, the Cowboys defensive backs pressed Sterling Shepard, Brandon Marshall, and the Giants receivers at the line of scrimmage, resulting in numerous coverage sacks and just 189 total passing yards from Manning, who was also sacked three times. The Giants’ run game was just as bad. Led by Paul Perkins’ 16 yards rushing, the Giants managed just two first downs on the ground and finished with 35 rushing yards. While the Giants actually showed some life to begin the second half, it ended with just three points. Manning led a 16-play, 68-yard drive to start the second half but a sack in the red zone by Charles Tapper stalled the drive. After stopping the Cowboys with just over eight minutes to play, Manning followed up one of his best plays of the night with a back-breaking interception. Starting from his own 10, Manning threw to tight end Evan Engram for a 31-yard gain, but on the next play he was picked off near midfield by Anthony Brown, all but sealing a win for the Cowboys. Originally handed a six-game suspension for violating the league’s personal conduct policy, Cowboys running back Ezekiel Elliott made the most of the time given, rushing for 104 yards on 24 carries and catching five passes for 36 yards. Now with a federal court injunction granted, Elliott’s suspension will be temporarily lifted and he could play the entire season as the Cowboys hope to return to the play-offs. Dak Prescott was solid in his season debut, going 24 for 39 with 268 yards and a touchdown. The game manager held up well in the pocket behind the best offensive line in the league, but he failed to connect on a big-yardage play. In fact, the biggest highlight in the Cowboys passing game may have come from Cole Beasley, who pinned the ball to his helmet along the sidelines for a first down. With an 11-yard reception in the second quarter, Cowboys tight end Jason Witten passed Michael Irvin (11,904) for the most receiving yards in franchise history. The 35-year-old, in his 15th season, later caught the Cowboys’ first touchdown of the season to give Dallas a 13-0 lead with just under two minutes remaining in the first half. Email “Giants miss Beckham Jr on offense as Elliott and the Cowboys roll to first win of season”. Feedback on “Giants miss Beckham Jr on offense as Elliott and the Cowboys roll to first win of season”.